"Anastasia" a stunning, double-sided portrait painting was created by master fine artist Elena Vladimir Baranoff during a nine year time period. The breathtaking artwork, painted on a 15 kg (33 lbs) basswood panel, custom designed by the artist, constantly traveled around the world with Elena and the sitter depicted in the portrait, fine artist Anastasia Elena Baranoff, Elena's daughter. The egg tempera masterpiece was painted on a marble gesso surface hand prepared by the artist using a special formula. The portrait painting is held by a fine decorative pedestal, hand carved out of pear wood by Russian craftsmen following Elena's most detailed, technical drawings. 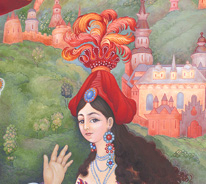 Created in the centuries old technique of egg tempera, incorporating semi-precious ground stones and natural mineral and earth pigments, with fine ornamentation painted in various types of gold with squirrel hair brushes, "Anastasia" is an extraordinary tour de force. A film granting an insider look at the creation of the portrait is coming this Autumn. Stay tuned. "Archbishop Kyrill of San Francisco & Western America"
Elena Vladimir Baranoff introduces a short film dedicated to her award-winning fine portrait miniature of His Eminence Archbishop Kyrill of San Francisco and Western America. 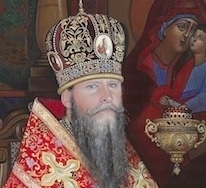 The ruling hierarch of the Western American Diocese of the Russian Orthodox Church Outside Russia, Archbishop Kyrill sat for the portrait miniature in his private home chapel in San Francisco. 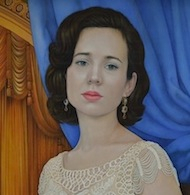 The miniature portrait was exhibited in 2008 at Mall Galleries, London and received the Gold Memorial Bowl Honourable Mention Award from the Royal Society of Miniature Painters, Sculptors and Gravers. This extraordinary miniature painting can confidently be named one of the greatest portrait miniatures in the history of fine art. For over 22 years Elena has been creating holy icon paintings in egg tempera and 24ct. gold, using recipes passed down from generations of Palekh icon painters. Beautiful icons painted by Elena are all in private fine art collections in the USA and Europe, including the icon The Virgin Enthroned in the collection of His Royal Highness The Prince of Wales and Her Royal Highness The Duchess of Cornwall. "Christmas Eve Is Here At Last"
Fine Art Short Film "Miniaturettes"
View four official "miniaturettes" featuring beautiful fragments of "Christmas Eve Is Here At Last", an original fine art composition by Elena Vladimir Baranoff, inspired by the literary work of E.T.A. 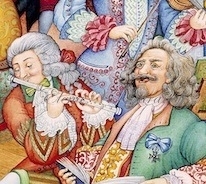 Hoffman and music of P.I. Tchaikovsky. These delightful fine art films are sure to uplift your spirits and bring with them the spark of magic! 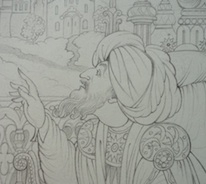 View the drawing mini-featurette to see how "The Golden Rooster" genuine egg tempera painting began with a beautiful fine art drawing. Experience "The Golden Rooster" genuine egg tempera fine art painting in detail by watching the 10 minute film with a musical accompaniment. Experience "The Golden Rooster" premiere by watching the official, narrated featurette created exclusively for the Elena Vladimir Baranoff Fine Art Channel. 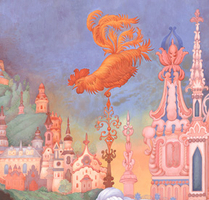 Inspired by the great literary works of Alexander Pushkin, Washington Irving and the opera of Rimsky-Korsakov, Elena Vladimir Baranoff created her very own vision of the mesmerizing tale of The Golden Rooster, painted in the artist's signature technique of genuine egg tempera. It is a story of power, bewitching love, magic and a broken promise.